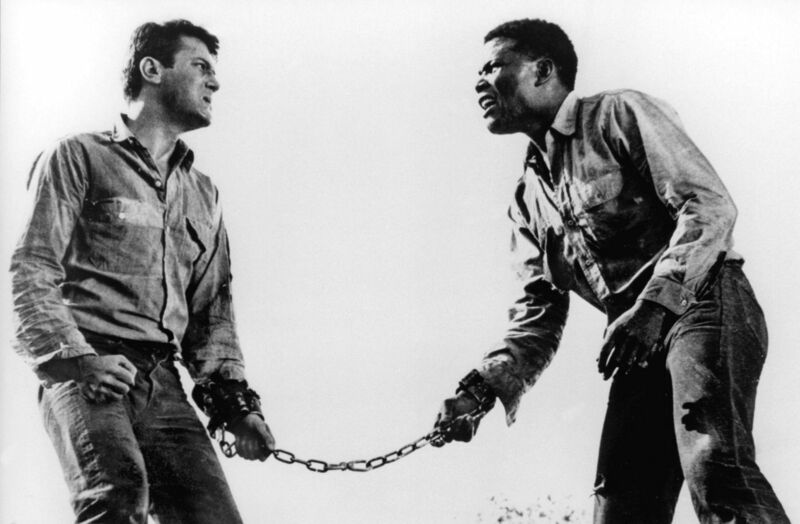 A potent drama about race relations packaged into an escape thriller, The Defiant Ones is an enthralling film. The intimate story of two tough men forced to survive together blossoms into an acute commentary about the ties that underpin a diverse society. When a prison transfer bus crashes on a rural road, two inmates are presented with an unexpected opportunity to make their escape. 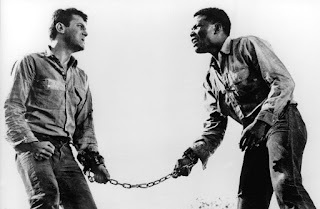 Cullen (Sidney Poitier) is black and proud of it, Joker (Tony Curtis) is white and an ignorant racist, and they are chained together. Despite their best efforts, they are unable to break their shackles, and so their wrists remain attached to each other as they trundle through the countryside on foot, running for hours to stay ahead of their pursuers. They are chased by a growing posse under the unconventional leadership of Sheriff Max Muller (Theodore Bikel), whose team includes sniffer dogs and muzzled dobermans. Cullen and Joker move from mutual hate to grudging dependence. When they fall into a muddy pit at a remote mine operation, they have to cooperate to clamber out. They then barely survive a lynching at a rough work camp where they try to steal supplies. Finally, they stumble onto the remote farm run by an attractive lonely woman (Cara Williams) and her young son Billy (Kevin Coughlin). By this time, the convicts are close to becoming friends. With the search party closing in, Cullen and Joker face tough choices that will test their unlikely partnership. 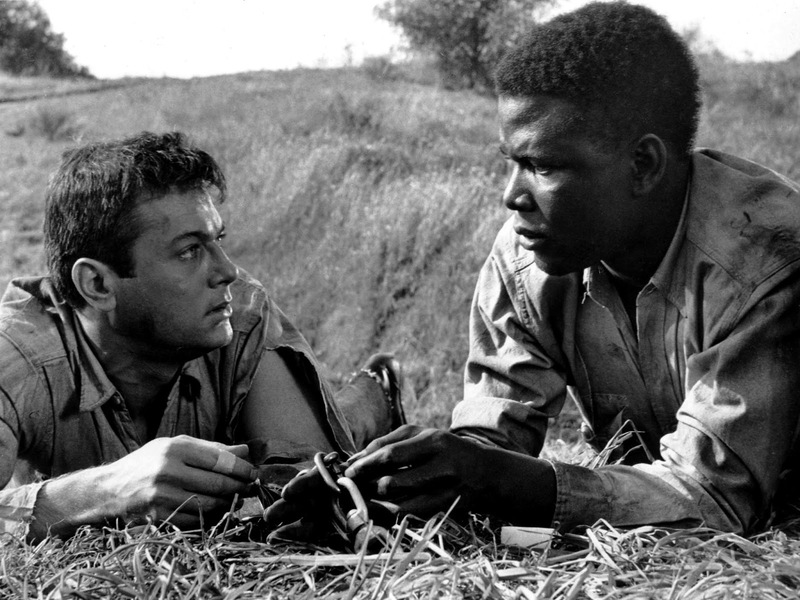 Produced and directed by Stanley Kramer, The Defiant Ones is a seminal achievement. The story of Cullen and Joker represents the reality of race relations between whites and blacks in the United States, stuck together and struggling to get along despite the obvious benefits of working together. Without ever descending into preachiness, the film confronts and acknowledges the tension born of ignorance, and then celebrates the strength and respect that come from combining forces towards a common goal. The initial antagonism directed at an unplanned union never quite goes away; but crucially, it fades into insignificance in the face of burgeoning humanity. Filming in black and white and concisely editing the drama into 97 gripping minutes, Kramer assembles the film in alternating scenes of escape, pursuit and reflection. Cullen and Joker are given plenty of opportunities to develop into real people with lives, ambitions, dreams and backgrounds. They start out as stereotypes in each others' eyes, and gradually grow into individuals worthy of respect, friendship, and trust. 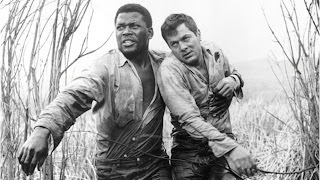 For the scenes on the run, the film provides no shortage of tense hide-and-seek thrills, as the two men stay just hours ahead of the law, navigating the bush, pursuing freedom and dodging the curiosity of strangers, all while hampered by their stubborn chain. 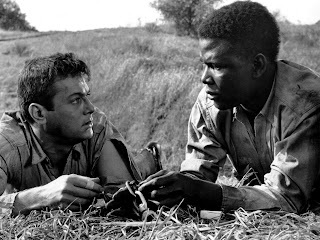 The Defiant Ones won the Academy Awards for cinematography, editing and original screenplay, and received a host of additional nominations, including for Best Film and Best Director. Both Curtis and Poitier were nominated as Best Actor, and while neither won (David Niven triumphed for Separate Tables), they are both stellar. Curtis in particular has rarely been better. He reveals a hardened edge to his persona, leaning his charisma towards the selfish dark side. Poitier plays to his strengths as the proud man occupying the moral centre and confronting bigotry head on, while working to reverse it with a combination of words and actions. Theodore Bikel and Cara Williams were also nominated for their supporting roles, and the cast also includes Claude Akins and Lon Chaney, Jr. as work camp men on opposite sides of the sympathy spectrum. The movie builds to an enthralling climax at a remote farmhouse, where opportunities arise for a fresh start, Billy' mother unveils a new level of desperation, hallucinatory dreams appear within reach, an alliance forged by the chain is severely tested, and a swamp and a train offer sanctuary, danger and maybe a final lunge towards coveted freedom. Weaker apart and stronger together, black and white are destined to learn to live with each other, but the terrain is tough and the tests unforgiving.